This Month's Night Sky - NOTE: The next paragraph describes the sky as it appears at 10 pm EST (11 pm EDT) near mid- month. The sky also looks this way at 11 pm EST (midnight EDT) during the beginning of the month and at 9 pm EST (10 pm EDT) by month's end. As May brings the lengthening days, the hours of nightly observation decrease as well, it is always with a bit of sadness that we say good-bye to the Winter and Spring constellations, Gemini, Leo, and Virgo. The early evening presence of Arcturus, the second brightest star in the northern sky, reminds us that the bright star clouds of the Milky Way will soon be brightening up those dark evenings when the Moon is small enough to allow us to truly enjoy those galactic treasures. As the evening turns to morning, the bright stars of the summer triangle follow until just before sunrise, the Milky Way is at the zenith, high overhead. Long twilight hours come to the northern hemisphere. MERCURY reaches 0 mag on the 12th, dazzling in the morning sky, best from southern locations on Earth. VENUS opens the month in the evening sky close to the Hyades star cluster. MARS moves into Capricornus increasing in magnitude to -1.2 as the Earth approaches on the move to overtake the red planet that is more distant from the Sun. JUPITER reaches opposition on the 8th. SATURN in Sagittarius rises around midnight, appearing earlier each day. URANUS returns to the morning sky by the end of the month. NEPTUNE rises in the morning just before twilight. Review how to determine Angular Measurement. NOTE: For those observers not in the ET zone, convert the calendar times to your zone's time by subtracting one hour for CT, two for MT and three for PT. Don't forget to adjust for Daylight Savings Time when necessary by subtracting one hour from your planisphere's time. Dawn and dusk times must also be corrected. See your local newspaper, TV news, or cable TV's Weather Channel for sunrise and sunset times or check with the U.S. Naval observatory. Unfortunately some of these events may occur during daylight hours in your area. 04 Saturn 1.7 deg S. of Moon. 05 Eta aquarid meteor peak. The shower produces up to 60 meteors at its peak. Dust particles for this meteor shower are generated by Halley's comet as it approaches the Sun on its 76-year orbit. A large waning Moon will be an issue during prime viewing hours. Mars 3 deg S. of Moon. 12 Mercury 2 deg S. of Uranus. 16 Aldebaran 1.2 deg S. of Moon, occultation from central and northern Canada, northwest Greenland, northmost central Russia. 17 Venus 5 deg. N of Moon. 20 Moon 1.7 deg S. of Beehive cluster aka M-44. 21 Venus .7 deg N of M35. 22 Regulus 1.5 deg S. of Moon. 27 Jupiter 4 deg S. of Moon. Spring is one of the best seasons for me in the northern hemisphere, the hours of darkness are still long and twilight fades more rapidly than in July. The night sky in the Spring is conspicuous for its absence of the Milky Way's bright star clouds. This is because we are staring up at the northern pole of the Milky Way Galaxy. As our home galaxy is a spiral type, it is shaped like a disk and most of the matter, stars and gas is present in the arms and the central bulge. As we look up into the northern sky during the Spring, the arms of our galaxy are snaking along the horizon, where its bright clouds cannot diminish our view of the galaxies that exist all around our own. Now is the time for the dominance of the distant galaxies whose faint light reaches our expectant telescope mirrors and lenses. The spring sky is dominated by the majestic lion of Leo, when conditions are ripe to observe galaxies. The best cluster of galaxies close to the Milky Way is the Virgo cluster. Sometimes the galaxy cluster here is referred to as the Coma Virgo cluster of galaxies because many are located in the nearby constellation of Coma Berenices. 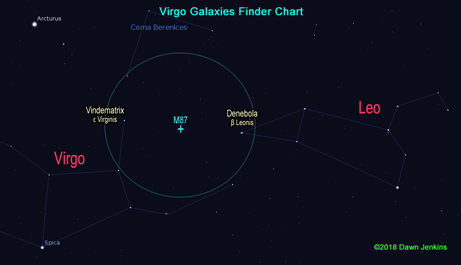 The finder chart here gives a rough idea of the location in the sky of the Virgo cluster. The heart of the cluster can be found by using the mid-way point between Epsilon Virginis and Beta Leonis. Along this line the galaxies M84 and M86 can be found together. A short hop below and to the east, the very heart of the cluster is the massive galaxy M87. M87 (NGC 4486) is a giant elliptical galaxy with a huge jet. This galaxy is the most massive and brightest elliptical galaxy that can be readily captured by amateur instruments. It is a well studied object. It boasts of containing 2,400 million solar masses and at least 12,0000 globular clusters. As a galaxy-gobbling behemoth, it is an x-ray emitter as well, commonly known as Virgo A. The jet has an x-ray output that is greater than the output of the massive black hole at the center of M87. From the center point between the guide stars (where M84 and 86) are located, amateur astronomers can move their telescope toward a "chain" of galaxies M87, M58, M59, and M60. Moving upward from the center one finds M99 and M98, They may also be found by using Como cluster stars and Beta Leonis. These galaxies are a real challenge to amateurs attempting to complete a Messier marathon. It is no accident that marathons are held at the time of year when these distant galaxies are high in the sky. Today's amateur may use computer-aided guidance to find any object they desire after aligning their equipment. Automated finding may make it easier to identify the galaxies in the Virgo cluster as well. But old-fashioned star hopping is a rewarding way to observe the galaxies. The best instrument ever used to study the Virgo cluster of galaxies is the Hubble Space Telescope (HST). Hubble’s Advanced Camera for Surveys (ACS) has been used extensively on the Virgo cluster. Taking an image provided by NASA (heic0815i), I have created the image below noting some of the cluster members. (The cluster contains 17 M objects.) Please note that this image is around 300 arc-seconds across, about 6x smaller than the moon's diameter! Such is the detail that the HST can offer. In the nearby constellation of Coma Berenices bright galaxies of the Virgo cluster are also located: M85, M88, M98, M99 and M100. 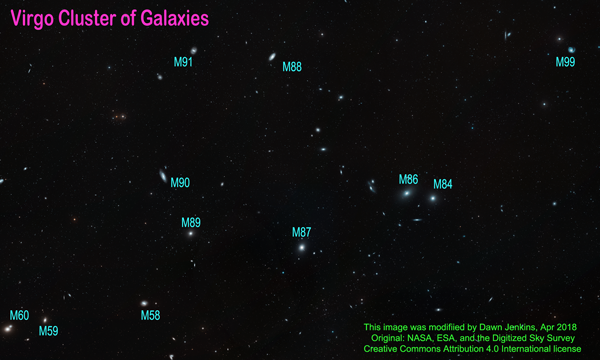 These galaxies shine about 10.5 magnitude. All but M85 are spirals. In addition to Virgo galaxies, located quite near to Alpha Comae Berenices are two star clusters, a globular M53, at eighth magnitude and another more peculiar cluster, somewhere between a globular and a galactic cluster. This globular is NGC 5053, only one degree from M53, magnitude 10.5. Together they form an impressive pair. Remember that the Virgo cluster is the central component of a larger conglomerate of galaxies known as the Virgo supercluster containing a million galaxies stretching over 110 million light-years of space. The Coma cluster is composed of many galaxies clustered in a spherical manner. Over 1,000 major and 10,000 dwarf galaxies reside here, clustered more densely than those in our Local Group that includes the Milky Way and Andromeda galaxies as the major constituents. The Coma cluster is more distant than the Virgo cluster and the brightest members are mag 12.7 and so are not readily observable in amateur instruments. --See You Under the Stars! This installment of "What's Up?" is ©2018 by Dawn Jenkins for Astra's Stargate. View Ron Leeseburg's Farewell Issue for information on where to find information such as is presented in this almanac.